Liviu-Dieter Nisipeanu (born 1 August 1976) is a Romanian-born German chess grandmaster. His peak FIDE rating was 2707 in October 2005, when he was ranked fifteenth in the world, and the highest ranked Romanian player ever. His highly aggressive style of play has earned him a reputation of a modern-day Mikhail Tal. In 1999, Nisipeanu as a clear outsider made it to the semifinals of the FIDE World Chess Championship by beating Vasily Ivanchuk in round 4 and Alexei Shirov in the quarterfinals only to succumb to the eventual champion Alexander Khalifman. Nisipeanu won the European Individual Chess Championship 2005 in Warsaw with 10 points out of 13 games, half a point ahead of runner-up Teimour Radjabov from Azerbaijan. 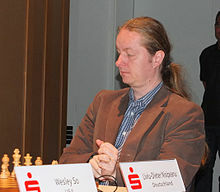 In April 2006, Nisipeanu played FIDE World Champion Veselin Topalov in a four-game match. Topalov won by a score of 3:1. The match was not for any official title. Since 2014, Nisipeanu has been playing under the German flag.